Part 1 looked at the first emergence of agriculture at the end of the last ice age. Part 2 looked at the early modern emergence of specifically capitalist agriculture though enclosures and colonialism in the Little Ice Age. Part 3 analysed the political economy of hunger. Ever since enclosures and colonialism began turning farming into capitalist agriculture around the world, agricultural capital has become increasingly centralised. Investment in labour-saving machinery reduced the demand for agricultural labour, driving an exodus from the countryside to the towns. It is this notion of capitalization which - perhaps unsurprisingly - helps make the most sense of capitalist agriculture. Geographically ‘small’ farms can be highly capitalized. Mazoyer and Roudart identify a ‘threshold of capitalization’ or a ‘threshold of renewal’, which represents the level of reinvestment (and hence, minimum level of gross profit) required to maintain the viability of the farm. This process corresponds to a secular trend towards greater capitalization in agriculture to maintain viability. However, not all farms operate at the same threshold of capitalization, and this accounts for the fact that the tendency towards greater substitution of mechanical and chemical inputs for labour does not simply create an ever-smaller number of larger capitalist farms worked by landless wage labourers. This does happen, but alongside this process a range of more differentiated and complex relations to capital proliferate. Perhaps most significant factor is the relatively low point at which economies of scale in terms of farm area turn into diseconomies. It is clear that a worker with the latest agricultural machinery can work a larger area than one with only hand tools or animal power. But combining ever-more workers on the model of the factory does not yield ever-greater economies. This could perhaps be compared to industries such as trucking or taxi cabs, where the means of production are often owned by formally self-employed workers, who nonetheless occupy a subordinate position in the value-chain, with the greatest profits captured downstream by properly capitalist intermediaries. This does not of course preclude some family-owned farms successfully accumulating capital and employing non-family wage labour. Here we see the analytic inadequacy of the ‘family’ concept for assessing agrarian class relations. Alongside the persistence of unpaid family labour and reliance on second jobs, the agrarian workforce is further differentiated through various relations. These include sharecropping, where workers are allowed to use land in return for pledging a portion of the product to the landlord. While this may appear similar to a feudal peasant-lord relationship, sharecroppers are usually producing commodities for the market and their landlords typically operate as capitalists, and there are no obligations of military service such as those which characterised European and Japanese feudalism. This does not preclude an element of subsistence production, i.e. production for the workers’ consumption among sharecroppers, but it would be a mistake to view such arrangements as a throwback, rather than a mode of labour exploitation thoroughly integrated into modern agricultural markets. The activist refers to this arrangement as ‘slavery’, but however it’s classified, such relations of micro-exploitation proliferate alongside the more familiar capital-labour wage relation. It is also often the case that individuals move between seasonal sharecropping and wage labour or work in several different modes at the same time. The category of ‘peasant’, while useful in drawing attention to persistent agrarian social relations other than simple wage labour, can also obscure these complexities. While Karl Marx is mostly known as a theorist of industrial capitalism, he was also interested in the effects of the capitalist mode of production on agriculture and the soil. Marx’s work on this topic is scattered across some comments in Capital, his earlier philosophical manuscripts, and his notes on the work of his contemporary, the agricultural chemist Justus von Liebig. This ‘ecological Marx’ has been reconstructed most notably by John Bellamy Foster and his collaborators, centering on the notion of the metabolic rift. In biology, metabolism is the set of life-sustaining transformations of matter and energy flows. A metabolic rift therefore, is a rupture in such flows. The prime example of such a rift, and the one which preoccupied Marx, is the depletion of soil fertility under the pressure of competitive commodity production. Traditionally, soil fertility was maintained by practices such as crop rotation, fallowing, and use of livestock. But as agrarian capitalism drove both productivity and urbanisation, the result was a steady depletion of soil nutrients. This was in part a result of producing greater yield demands on the soil, and in part a result of the spatial break in the nutrient cycle as human waste accumulated as a public health hazard in the cities as opposed to being metabolised by detritivores in the soil. In places, this problem was countered by the use of ‘night soil’ (human excrement, gathered by night to spread on the fields).This maintained fertility, but was also a vector for infectious diseases. In industrialising England, the crisis of soil fertility was met by the massive import of guano, as the colonies were plundered to sustain the agricultural production of the core (the potato blight which depopulated Ireland is now thought to have been imported with potatoes alongside Peruvian guano).17 Guano remained a vital agricultural input until the early 20th century, until the invention of the Haber-Bosch process, a method for fixing abundant atmospheric nitrogen into bioavailable forms by means of ammonia synthesis. 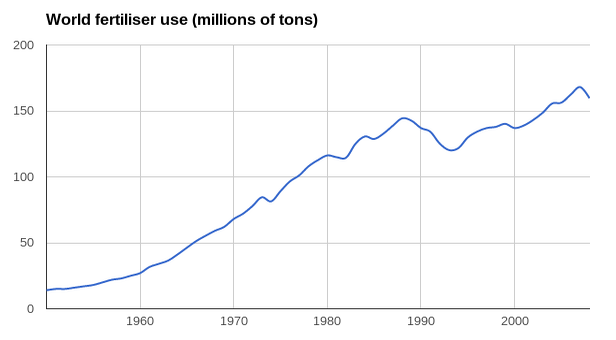 Graph based on Worldwatch Institute spreadsheet compiled from UN Food and Agriculture Organisation and International Fertilizer Industry Association data. Thus insofar as fossil fuels are the energy source, the process contributes to greenhouse gas emissions twice, since the method of ‘steam reforming’ to produce H2 gas from CH4 produces CO2 as a byproduct. It contributes three times if the emissions from transporting manufactured fertiliser back to agricultural regions are included. The purpose of this brief chemistry lesson is to highlight that the metabolic rift in the nitrogen cycle is not resolved but displaced onto the carbon cycle. The performance of the Green Revolution was mixed, but is generally held to have significantly boosted world food production. In addition to fertiliser and pesticide inputs, which had to be purchased on the market from agrochemical firms, the HYVs also required substantial irrigation to produce higher yields. The combined effect of this was thus to raise the threshold of capitalization for farms. Productivity gains increased the agricultural surplus population, and hence the rate of migration to the cities. “The Green Revolution is basically an extension of capitalist agriculture to the tropics”, writes Harry Cleaver. This then is the agrarian context in which climate chaos looms. On the one hand, a vast concentration of capital that has given rise to modern agribusiness and an historic urbanisation of the world’s population. On the other, there has been proliferation of rural social relations organised largely around the market; including family labour, gendered exploitation, sharecropping, small-scale capitalist farms, petty commodity production, and wage labour. Furthermore, the metabolic rift in the nitrogen cycle has been displaced onto the carbon cycle: world food production has become massively dependent on fossil fuels. Already we hear the dismal forecasts of that most hardy of perennial species - the Malthusian. It is in this context that biofuel production is being promoted as a ‘green’ alternative to fossil fuels - while taking land out of food production. Meanwhile, agribusiness promotes proprietary biotechnology as the solution to hunger and climate-threatened yields, while financialisation leads to greater food price volatility. Will unmitigated climate change (finally) prove the Malthusian prophecies of carrying capacity overshoot correct? These are the questions we’ll take up in the next installment. 2. Ratios in terms of weight yields per worker. Marcel Mazoyer & Laurence Roudart (2006), A history of world agriculture, Routledge, p.441. 4. See Table 1 here. 5. Henry Bernstein (2010), Class dynamics of agrarian change, Kumarian Press, p.93. 7. Mazoyer & Roudart p.378. 8. Mazoyer & Roudart p.418. 9. Mazoyer & Roudart, p.420. 10. Mazoyer & Roudart, p.421. 11. Mazoyer & Roudart, p.435. 14. GRAIN, Hungry for land: small farmers feed the world with less than a quarter of all farmland. 16. Karl Marx, Capital Volume 1. 17. Source. However, the responsibility for the famine was not principally biological but political-economic; the British colonial authorities’ free trade policies ensured “huge quantities of food were exported from Ireland to England throughout the period when the people of Ireland were dying of starvation.” - Amartya Sen, Poverty and famines, Oxford University Press, p.161. 18. Mazoyer & Roudart, p.385. 20. How a century of ammonia synthesis changed the world, Nature Geoscience. 21. We say from a climate change point of view, as there are also other ecological considerations, such as pollution from fertilizer run-off creating ‘dead zones’ in waterways. 22. Harry Cleaver, The contradictions of the Green Revolution. 23. Harry Cleaver, op cit. 24. BBC, Indian farmers and suicide: How big is the problem? The Haber process is now responsible for fertilising the food which feeds almost half of the world’s population. The problem is, from a climate change point of view, that the process produces CO2 as a byproduct. Done. Does the 'book' need a picture/tags? Haven't finished reading this, but what does 'secular' mean in this context? Secular means longer-term underlying trend, as opposed to fluctuations or cycles (wikipedia). Incredible work here. I just finished conducting an online seminar on the Anthropocene/Capitalocene and one of the things that was underdeveloped was this thorough analysis of the role capitalization of agriculture is playing in the exacerbation of climate change. Will the next installment deal with the transgression of planetary boundaries explicitly? It's definitely implied in what you're saying, but I suppose I'm curious and hopeful for a spoiler. Thanks so much for your work. The Stockholm Resilience Rentre's 'planetary boundaries' analysis? Probably at least 5 of their 9 'boundaries' would be relevant. Not sure if we'll fit it in, as already trying to cover a lot of ground. Can always split it across more than one article though, so will see! Will also need to read up on it a bit more, just in case it's the Malthusian 'Limits to Growth' stuff rebranded.